As a US Marine, Lucas A. Dyer engaged in combat with the Taliban in Afghanistan?s heroin capital of Helmand. He fought in the Battle of Khanjar while participating in Operation Enduring Freedom from May 2009 to December 2009. He was one of the four thousand Marines who fought under Brig. Gen. Larry Nicholson as a member of the Second Marine Expeditionary Brigade, which also included 650 Afghan soldiers. As a small unit leader and platoon commander leading Marines in battle, he fought terrorists and their allies on their home turf, witnessing unspeakable violence in the process. At a certain point, however, he and his fellow Marines realized that an eye for an eye would not accomplish their objectives; that marked a turning point for them, and a basis of true success began to unfold. Relying on counterinsurgency operations, they began shaking hands one at a time?and that was how they ultimately drove the Taliban away. Day by day and week by week, they proved that a small fighting force could work together with Afghans to become brothers-in-arms. 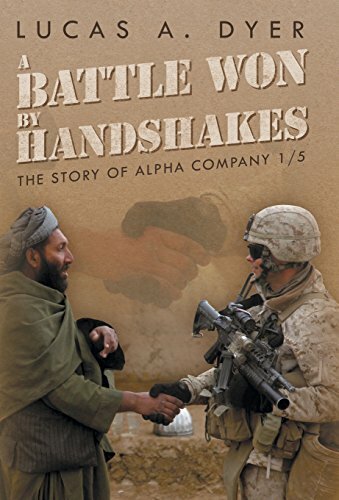 In this memoir, Dyer recalls the events of his time in Afghanistan, sharing true stories from the front lines of how his company was able to win their battles through handshakes.